This is for patients already diagnosed with hypertension. To get started, use the "submit blood pressure readings link above, or search the Apple App Store for “eConsult”. What is the hypertension review? To help keep you healthy, your GP reviews your blood pressure on a regular basis. The hypertension review lets you submit your blood pressure readings to your practice via a simple online form, available from the practice website - or via the eConsult iPhone app. How does the hypertension review work? To submit your review, visit the practice website or download the eConsult app from the Apple app store. Add your details, enter at least three blood pressure readings and answer a few quick questions. The information is then sent securely to the practice. We will contact you to confirm receipt and advise of any further steps. 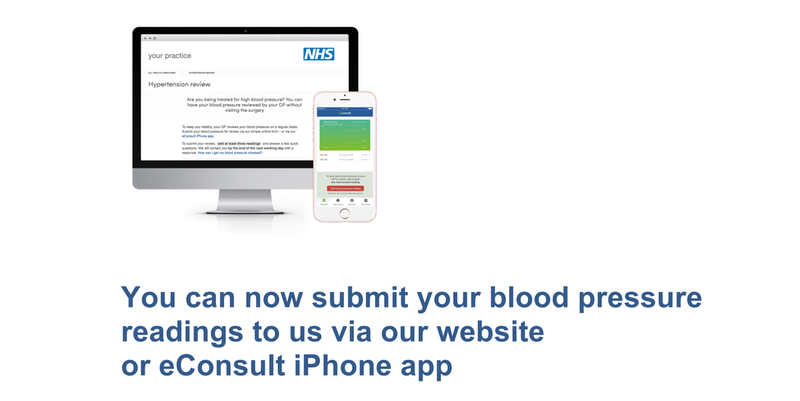 If you download the app and enable notifications, you will also get regular reminders about when to enter your blood pressure readings and submit your next review. You can even sync your readings from a Bluetooth-enabled measuring cuff. How can the hypertension review help me? The hypertension review potentially saves you having to attend the surgery and may improve the treatment of your blood pressure over time. When you submit your hypertension review via the online form or app, your GP or nurse will be able to compare your submission with your previous readings on file and recommend adjustments in your treatment or offer lifestyle advice. Only the practice will have access to your blood pressure measurements and responses to questions if you submit them. If you use the app, your data will also be stored on your phone. What happens with my information once the practice receives it? Your details and blood pressure readings are sent to the secure practice email inbox. The practice administration will pass this information on to the GP or nurse. Will I continue to see a GP or nurse for regular blood pressure reviews? The hypertension review may allow your GP or practice nurse to manage your blood pressure remotely. However, dependent on your readings and responses to any questions, you maybe called into the surgery for a face-to-face review. Whether your review is completed remotely or in person your practice will inform you of the date of your next review. We strong recommend that you record this date to enable to submit your data proactively. If you are using the app then you will be able to record this data within the app to receive a reminder. Can I request medication through the form or app? Although your GP may change your prescription as a result of your hypertension review, if you require a regular refill of your usual blood pressure medication, this will have to be requested through the practice’s usual channels. Can I make an appointment to see a GP or nurse through the online form or app? No. If you would like to make an appointment to see a GP or nurse, please contact the practice directly. What should I do if I have a very low/high BP reading? The eConsult hypertension review form and app will both detect if you enter a very high or very low reading and may suggest you seek urgent advice if this is the case. I am experiencing technical issues with my app, who should I contact? Is the app available on any other smartphone formats? eConsult are actively developing an Android version of the app. If you are not using an iPhone you will still be able to submit your Hypertension Review via the eConsult service on your practice website.